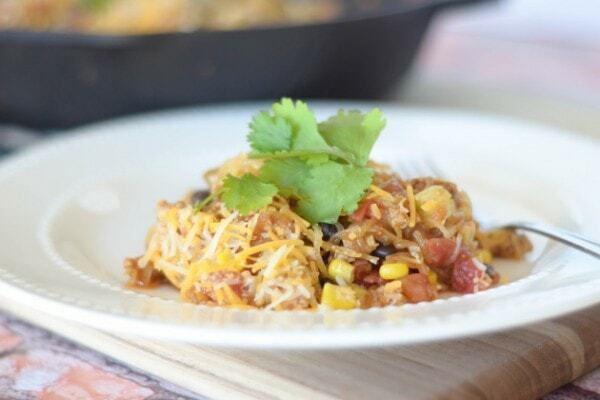 Make dinner a crowd pleaser with Spaghetti Squash Taco Skillet! It must have been two years ago now that I was first introduced to spaghetti squash; I lived nearly all my life to that point without ever trying it. It was life changing. I absolutely LOVE cooking with spaghetti squash now and use it frequently throughout the week. 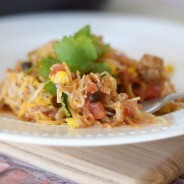 My new favorite though, Spaghetti Squash Taco Skillet! I think I have a not-so-secret fetish with preparing it, something about scraping all that squash out and seeing it turn from something inconsequential to something delicious is just relaxing to me. It’s weird, I know. Regardless, spaghetti squash is delicious and it can be prepared in a variety of ways. 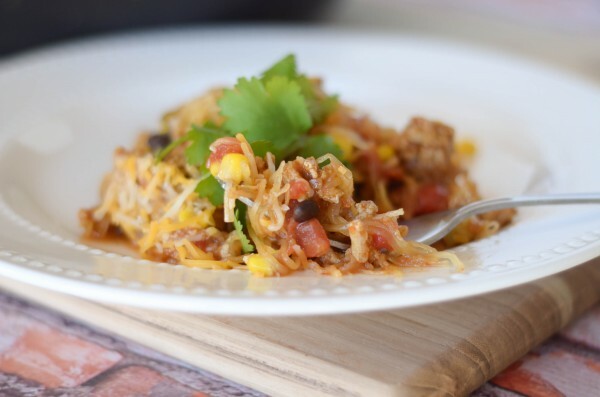 I recently was craving my taco pasta, but I decided to swap the pasta with the spaghetti squash. 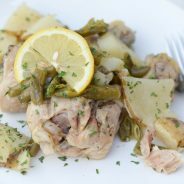 It was an instant hit at our home and now on the menu rotation regularly! Instead of ground beef with this dish, I decided to use ground chicken – but you can use beef, turkey, or chicken based on your preference. I have actually found recently that unlike years past, I can get ground chicken cheaper than I can get ground beef at the store, so we have that more now. Using ground chicken is probably a good thing diet wise too, so I’m happy to see the price drop in it over the years. I simply cooked the ground chicken then added in the taco seasoning. Once I had that made, I combined all the ingredients into a large cast iron skillet, topping it with cheese and cilantro. 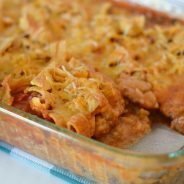 It was like a spaghetti squash casserole bursting with flavor and a great spicy taste too, without any bake time! My husband was back for seconds, digging into this dish. 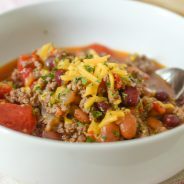 It can be toppedwith any of your favorite toppings including sour cream, salsa, or guacamole too. Are you a fan of spaghetti squash? If so, this is a good one to try! 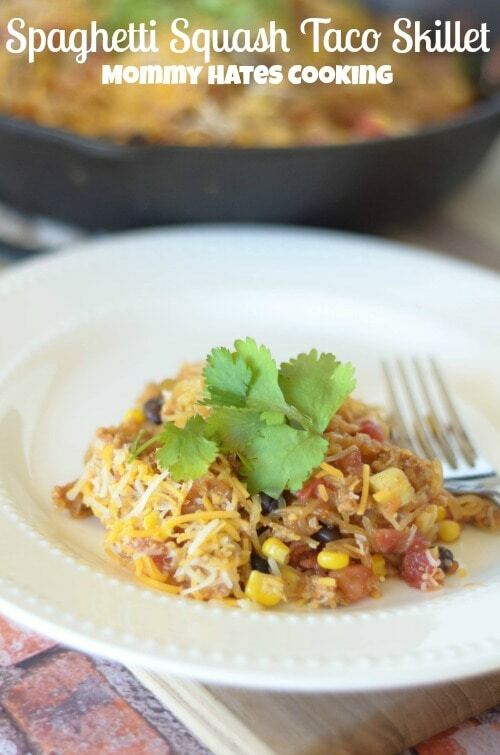 I am sharing Spaghetti Squash Taco Skillet over on Food Fanatic, be sure to stop by for more great recipes! Begin by preparing the spaghetti squash if you have not already, this will take up the majority of the prep time. 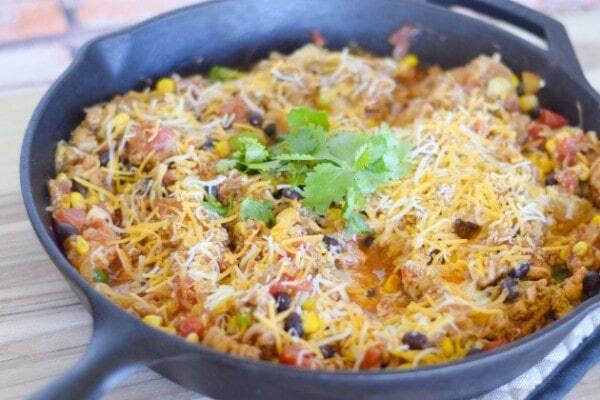 Spray a cast iron skillet with non-stick cooking spray, and cook the ground chicken until well done. Add in the taco seasoning in accordance with the package instructions. Once the meat is done simmering, add in the spaghetti squash, tomato sauce, tomatoes, black beans, and corn. Mix this well and let simmer for about 10 minutes until it is cooked through. Garnish with cheese and fresh cilantro then serve.